Every gardener knows the benefits of earthworms: they are little humus-creating machines that recycle organic material as they travel, aerating and enriching the soil as they go. 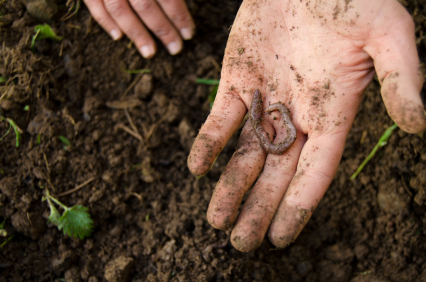 Worm castings (excrement) – and eventually the worms themselves – decay and release nutrients back into the soil. Grass, plants and trees all benefit from the activity of worms. It’s tempting to try and improve your soil by adding more worms -- and there are plenty of places willing to sell them to you for this purpose. But soil that is inhospitable to your own worms is not going to be any more attractive to imported worms – and you wind up with some really expensive dead worm fertilizer. There are ways to make the soil more worm-friendly, and that can start a cycle of soil improvement. Aerating compacted soil can help to make a better environment for both your worms and your plants. In addition to core aerating lawns, our Almstead arborists also use compressed air (with a tool called an Air Spade) to loosen soil around tree roots or heavily compacted places. Tree and plant roots are able to receive more water through the aerated soil – and moist soil is also worm heaven. The other thing that worms (and plants) need is nutrition. That is one reason that we enrich soil with compost and leave a thick layer of mulch on top: the worms will eat the organic material and then recycle it through the soil. Healthy soil is not just filled with earthworms – it also contains beneficial bacteria and fungi. All these organisms, along with the roots of trees and plantings, interact to perpetuate a cycle of healthy soil creation. Here at Almstead, we like to help this process with applications of Compost Tea -- a carefully-balanced, liquid compost. We brew our Compost Tea from top quality leaf and twig compost and add organic nutrients like worm castings. We nourish the beneficial microorganisms with humates and fish oil to create a nutrient-rich liquid that helps to jump-start tree, lawn, plant (and earthworm) health.